I Come Bearing Tidings of Great Joy! Thanks to half-serious brainstorming with Aaron, Trish, and Becca, the first draft of the unfortunately untitled Demons 3 HAS A WORKING TITLE. I repeat: I HAVE A WORKING TITLE. Ladies and gentlemen, I am pleased to introduce to you Stains of Grace (working title), the third novel in my Saltmarch Trilogy. I might be a chick with a thing for words, but I cannot express how relieved and excited I feel to have a title for this book! I have never yet gotten this far in a novel without having at least some idea for a title, and the lack thereof has bebothered me with vigor. And I just realized why this lack hath vexed me so. 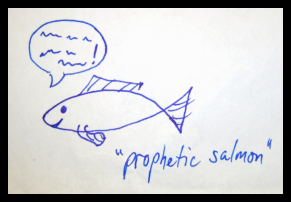 I think I subconsciously believe that until I have a working title for a story, I don’t have permission to finish it. I must needs rid myself of this mental hangup. And stop talkin’ pseudo-Shakespearean. Onward, then. In other news, my darling dears, I am so close. The newly working-titled Stains of Grace is THIS CLOSE (see my thumb and forefinger hovering just two teensy-weensy millimeters apart in front of your face?!?) to being finished! I want this draft to be done. I need this draft to be done. Yes, I’ve loved the adventure. Yes, I’m into Anne, my main character, and I have a special place in my heart for the others. Owin and Peter (aww, Peter!). Thomas. Daniel. Even Dante, who has finally shown up “in the flesh” (or not, rather). I notice that I have an overabundance of male characters — but then Holly’s got her own troubles, Seal and Jas wisely chose to stay in Oklahoma City, and I’m honestly considering cutting Nora out completely. Anyway. Of course I love my story. (Every writer loves her story.) 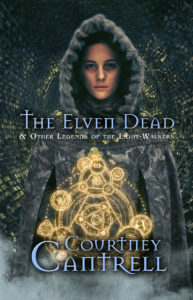 I don’t want to take leave of my characters, and I especially don’t want to take leave of the Saltmarch universe — because this is the last book in the series, and I’ve spent a lot of time here over the last three years. Typing “The End” in this draft means saying goodbye to a whole world and to a group of people I’ve come to love. And I am going to miss them. Their story needs to come to a close, for I shall very soon turn my attention to Colors of Deception once more. Final edits are coming up, and I’ll be obliged to give them my full attention. But I require closure on #3 before I can dedicate myself to #1 again. 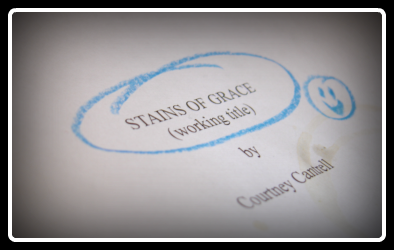 Closure means finishing Stains of Grace Draft 1, giving it a once-over, and then handing it off to my beta readers. I am very ready to do that.